We are excited to announce that Cody™ Coursework™ has been improved and renamed MATLAB® Grader™. MATLAB Grader continues to provide instructors with all of the same functionality that was available in Cody Coursework, along with many improvements and new features. For more information about MATLAB Grader, see the product information available at https://www.mathworks.com/products/matlab-grader.html. For existing links you have to courses running in Cody Coursework, pages will redirect users to the same course within MATLAB Grader. When signing into MATLAB Grader for the first time, all prior courses and content will be waiting and available. However, you should update any existing links to Cody Coursework to now use: grader.mathworks.com. When you select Add Problem, you can start with a blank problem, re-use one of the Example problems, or even re-use any of your own existing problems, including those shared with you by others. You can collaborate with other instructors and content authors when creating content collections. 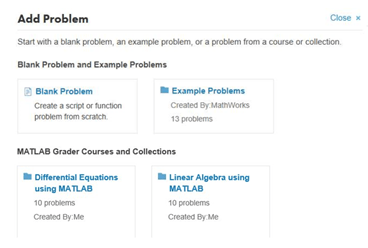 Integrate MATLAB Grader coding problems into courses hosted in a learning management system (LMS), such as Blackboard®, Moodle™, Canvas®, or any other LTI 1.1 compatible platform. 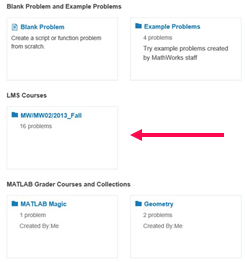 When you link your LMS course with MATLAB Grader, problems from that course become available for re-use.